The swimmers from Livingston and District Dolphins Rainbow Squad competed in their Club Championships over the weekend of 7th/8th November. 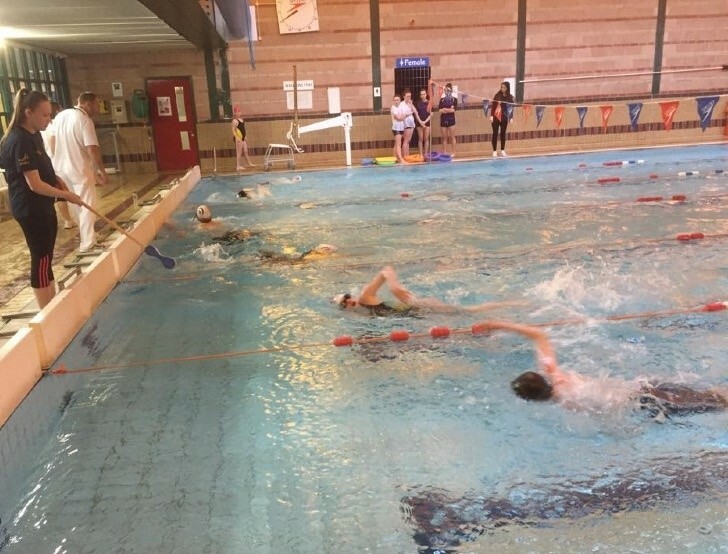 Twenty four swimmers competed in a variety of events ranging from width races for the Learn to Swim swimmers to longer distance events for the competitive squad swimmers. Swimming in the Rainbow Squad Club Championships were: Merryn Binnie, Kate Bolan, Ellie Cockburn, Ethan Dunn, Ross Elliot, Sam Elliott, Stewart Farquhar, Calum Finnigan, George Forbes, Patrick Gamble, Brandon Gilmour-Griffiths, Scott Haggarty, Dean Hamilton, Aaron Hume, Johanna Hume, Dylan Hurst, Calum Leather, Aaron McDowell, Corey McDowell, Alexandra McGuigan, Beth Norris, Lucy Pollock, Nathan Snape, and Cameron Tweedie. The swimmers are photographed being presented with their medals at the end of the event by the Rainbow Squad coaching team and Flipper the LDD mascot. The Rainbow Squad top swimmer and most improved swimmer will be announced at the LDD awards evening on Wednesday 11 November. The Club would like to thank all the coaches and parents for their ongoing support and help in organising and running the event. Also, thanks to the poolside helpers and the officials. Well done to all swimmers.